Check out the new Julie Andrews Community and Share A Memory of a favorite reading experience with a child. Little Brown Books for Young Readers will donate a book for each story shared to the Reach Out and Read of Greater New York. 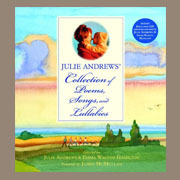 There are also downloads of nursery posters and notecards featuring some of the art and poems from Julie Andrews Collection of Poems, Songs and Lullabies.